What would the wind look like if you could see it? A new and exclusively commissioned piece for Quays Culture and The University of Salford, Aeolian Light is a monolithic, immersive light installation in the heart of The Quays that visualises the wind as an illuminated, chaotic force. The large-scale FREE outdoor sandbox experience will sit on the Plaza between The Lowry and the Lowry Outlet, from 18 December 2014 until 7 January 2015. Artists Squidsoup invite you to this walkthrough experience. 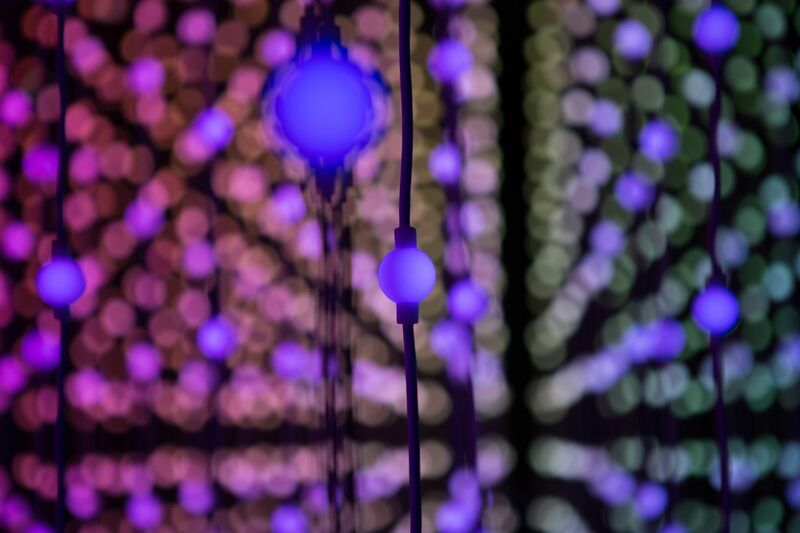 Using individual points of suspended light to create feelings of presence and movement, the 10msq installation creates a hybrid environment where virtual and physical worlds coincide. 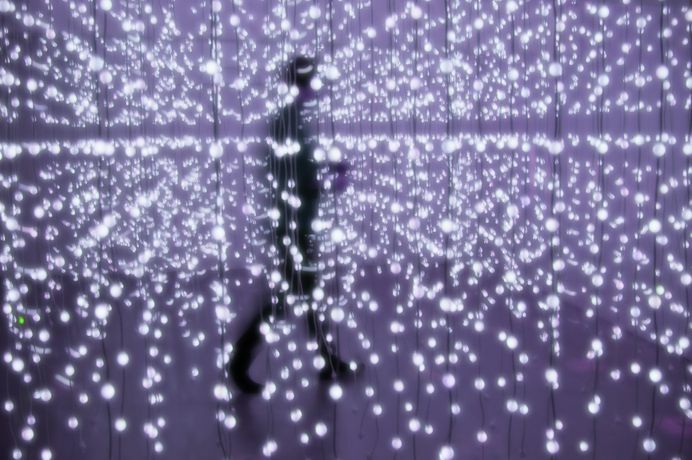 The colossal volume of light transforms the pixels of a virtual world in to a physical space, exploding thousands of points of radiance in to three dimensions, floating and changing colour in response to the wind and human movement. Aeolian Light is a bespoke creation for its location. Taking inspiration from The Quays’ notoriously windy environment, the light installation will turn these gusts into a visible phenomenon. As you walk through the artwork, the wind will be visualised as light in the space around you. When the wind blows hard the space feels chaotic and turbulent – with many lights flickering and forming. On quieter evenings, the experience is calm and gentle. By walking and playing amongst the lights, you will disturb the flow of the wind, leaving trails of luminescence as you move through the space. The artwork builds on six years of research and development by its creators Squidsoup, an internationally based group of artists, researchers and designers, passionate about immersive, interactive, volumetric installation art using 3D arrays of individually addressable LEDs, which have been created from adapted video wall technology. The Quays is Greater Manchester's waterfront destination, bordered by Manchester, Salford and Trafford. Over the last two decades it has been transformed from an industrial docklands to an international destination for leisure, living, tourism, sports and the creative industries. It is also home to some of the most spectacular attractions and iconic buildings in the UK and has fast become one of the Northwest’s unrivalled cultural destinations. Aeolian Light is the latest in a series of major, outdoor events to take place at the waterside location following the success of Honour earlier this year.